Hollybeary Creations : YNS May Release Sneak!! Hello everyone.. It's time for the Your Next Stamp May Release and we are starting things off with the Sneak Day!!! Head over to the blog for a full list of the blogs to get a preview of what's coming tonight at 10pm est. My project is a peek at Waddles Fortune Teller Set and Dies and the new Frosted Glass Gumdrops!! I created a Distress Ink background on a piece of watercolor paper using some Squeezed Lemonade and Mustard Seed Distress Inks. Once the panel was dry I die cut it using the Stitched Rectangle Die set. I cut a window in the lower portion of the card using the Flip Up Window Die Set. 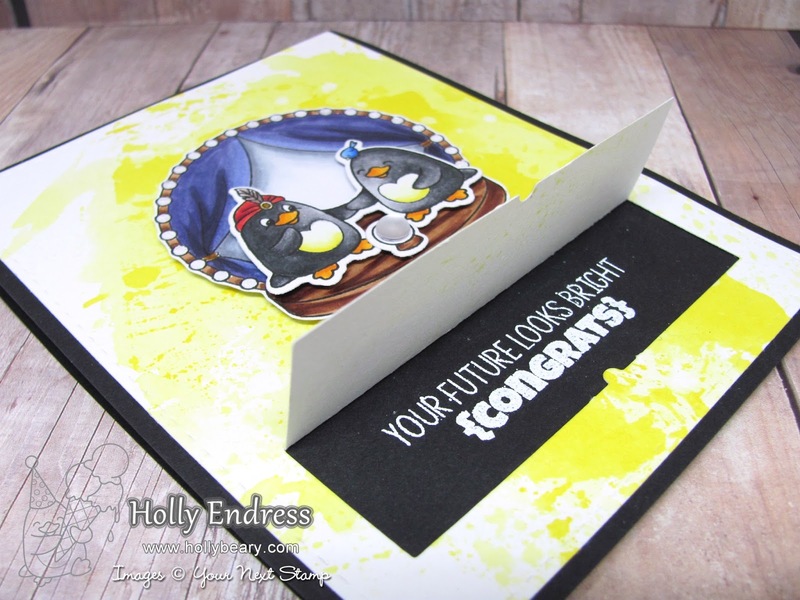 I adhered the Distressed panel to a Black top folding card base and then I stamped a sentiment from the Fortune Teller Waddles set inside the window and heat embossed it in White. I stamped a second sentiment on a strip of watercolor paper and adhered it to the outer portion of the window. The images were stamped with Black Olive ink on some X-Press it card stock and colored in with Copics. I used the coordinating dies to cut the images out. I adhered them on the main panel using some foam tape. Then I added some Nuvo Drops to the lights around the stage and a Frosted Glass Gumdrop to the Crystal Ball image. 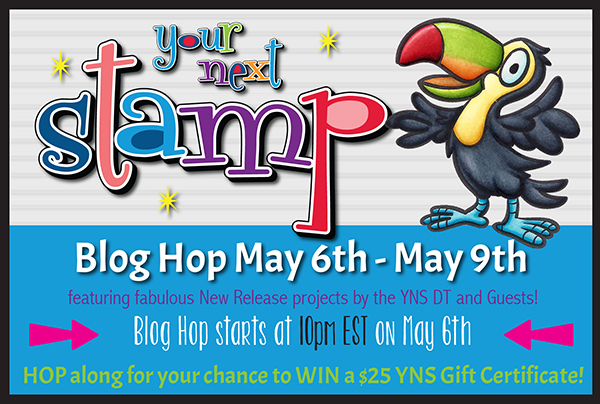 Be sure to join us at 10pm est tonight for our May Release Blog Hop and a chance to Win a $25 GC to the store. What a totally fun card. The frosted gumdrop on the crystal ball is brilliant. Thanks for sharing a sneak peek of what promises to be a great stamp set. those are too cute!! I just ordered that globe cool to see iy used with out christmas in mind!!! Wow such a good design! 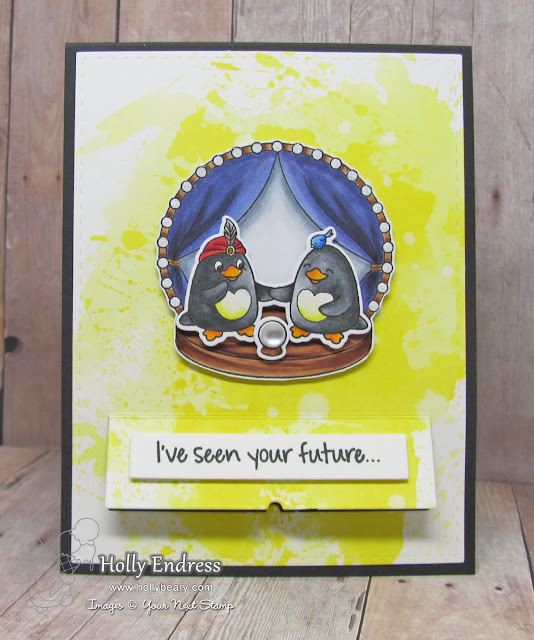 Brilliant card with the peek a boo sentiment Holly.